At last, a safe, simple, secure way to haul your motorcycle in a pickup, van or a trailer. 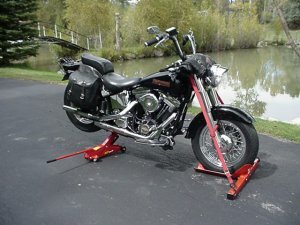 Whether you own a Harley or any other brand of motorcycle, you need a this Stand to haul your bike. Keyhole shaped slots in the bottom of the chock portion of the Stand make installing or removing it a 30 second task once the hardware has been installed in the floor of the transporting vehicle. Simply attach the Stand to the floor, roll your bike into place and attach tie downs (not included) to the cross bar and to the motorcycle. Then haul your motorcycle to where the fun is! Eliminates the need for "D" rings or tie down points anywhere else. Makes a great work tool also. Use it to hold your bike upright and stable for simple maintenance or major repairs. Attach either wheel of your bike to the Stand and the end of the motorcycle not attached can be raised as needed by jacking or any other safe means of lifting. PREVENT THEFT! 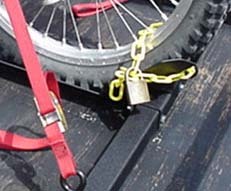 Once attached to your pickup, van, or garage floor you can easily lock your motorcycle to it by running a chain or cable through the loop welded to the front of the "shoe" and the wheel of the motorcycle. No one else offers you a lifetime warranty on their motorcycle stand. Extensions are offered to extend the width of the crossbar for motorcycles when you can't attach tie downs to the forks. Simply attach them to the ends of the handle bars and to the extensions. $54.95 pr. Transport + Maintenance Stands Motorcycles, ATVs, etc. Five of us hauled our bikes to Arizona Bike Week 2000 in this 18' enclosed trailer over 1,500 miles of rough highway and Interstate. Haul Your Motorcycle on a Trailer or in a Pickup. 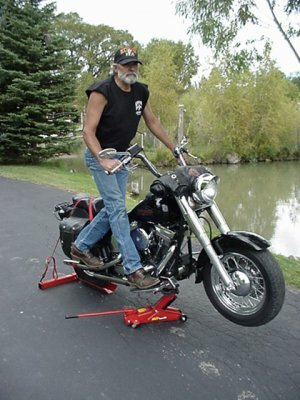 Use in the garage, the driveway, or anywhere else that you want to stabilize your motorcycle.